Each island seems to have its own Golden Sand, but the Golden Sand Beach of Andros appears to be shinier. It’s really gold! Its golden sand spreads like powder, alongside blue, almost turquoise waters. This combination gave Golden Sand Beach exotic glamour, from the beginning. 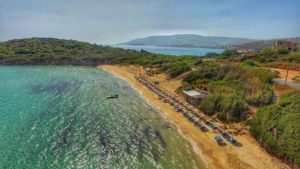 It is one of the first beaches of the island with a beach bar, a pole of attraction for many tourists since the beginning of Andros tourist rise years ago until today where many options are available. With easy access from the main road that leads from the main port to Chora and only 2 km away from Gavrio, it was not difficult to become so famous for both Greek and foreign visitors. It is not just beautiful but also easily accessible. In addition, it is not only gold but also exceptional. Golden Sand Beach has a double name. Many locals, call it “Psili Ammos” which means thin sand. Golden Sand Beach is an idyllic place of superior natural beauty, and at the same time offers much more than that. Because of its position, it is naturally protected from strong winds and the, and so it is an assured choice for swimming, without being whipped by the sand. The homonymous beach bar is a reason to be visited by anyone. It is a regular choice for the youngsters, without excluding families. The truth is that it packs quickly, as its length is not long, but you will love it.